Our summers are short, and not too warm. When there is sun, they are perfect (although still – short). Maven and Miii are going outside when we wake up (the cats go to sleep and wake up when we do, almost always), and run around on our lot. Leroy joins them a bit later and stays out shorter. I took this picture yesterday, close to sunset. 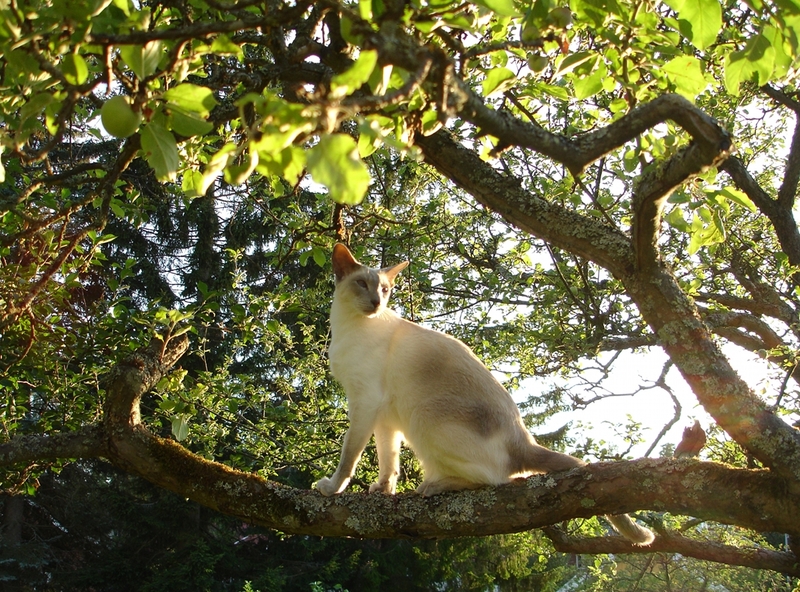 Leroy in one of the old apple trees behind our house. Our cats are not outside cats, but they go out during the summer, when it is sunny. Albert never went out, he goes only to the balcony (only recently he started showing some interest for the outside world. I hope to be able to take him out, on a cat-leash when he heals and I can put a little vest on him). Miii and Leroy do not go to strangers and they stay close to us. I did not teach them to do that, that is just how they are. Maven, on the other hand, is flirty and cuddly even with strangers. I am against letting cats go out and roam freely, in principle, there are so many dangers out there, before all – cars, other cats etc, but – under controlled forms, going out is very good for their well being and immune system. What a lovely sight that is! The sun shining through cat fur, my favorite.